Carbon (C) conservation and sequestration in many developing countries needs to be accompanied by socio-economic improvements. 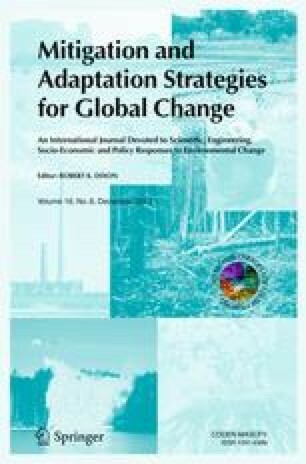 Tree crop plantations can be a potential path for coupling climate change mitigation and economic development by providing C sequestration and supplying wood and non-wood products to meet domestic and international market requirements at the same time. Financial compensation for such plantations could potentially be covered by the Clean Development Mechanism under the United Nations Framework Convention on Climate Change (FCCC) Kyoto Protocol, but its suitability has also been suggested for integration into REDD + (reducing emissions from deforestation, forest degradation and enhancement of forest C stocks) currently being negotiated under the United Nations FCCC. We assess the aboveground C sequestration potential of four major plantation crops – cocoa (Theobroma cacao), oil palm (Elaeis guineensis), rubber (Hevea brasiliensis), and orange (Citrus sinesis) – cultivated in the tropics. Measurements were conducted in Ghana and allometric equations were applied to estimate biomass. The largest C potential was found in the rubber plantations (214 tC/ha). Cocoa (65 tC/ha) and orange (76 tC/ha) plantations have a much lower C content, and oil palm (45 tC/ha) has the lowest C potential, assuming that the yield is not used as biofuel. There is considerable C sequestration potential in plantations if they are established on land with modest C content such as degraded forest or agricultural land, and not on land with old-growth forest. We also show that simple C assessment methods can give reliable results, which makes it easier for developing countries to partake in REDD + or other payment schemes. Thanks are due to Dr G. Nkansah (Head of Centre ARC-Kade) and Dr K.G. Ofosu-Budu (Deputy Head of Centre ARC-Kade) for their collaboration and support in the field at ARC-Kade. We are also grateful to Adu Solomon for assisting us in the plantations, Dr S. Adjei-Nsiah for local weather data, and Josep M. Kokroh for farming data. At the University of Copenhagen, thanks are due to Henrik Breuning-Madsen for providing contacts in Ghana, biometrician Henrik Meilby for guidance in the carbon calculations, and Bjarne Fog for technical GPS- and GIS-support. The project was partly funded by grants kindly provided by the Løffler and Steensby’s Foundation, the Oticon Foundation, and the University of Copenhagen.